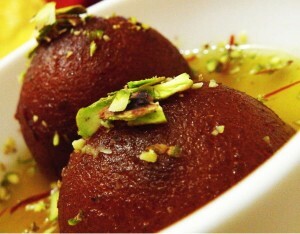 Pantua: Pantua is a local confection of eastern India and Bangladesh. It is a traditional Bengali sweet made of deep-fried balls of semolina, chenna, milk, ghee and sugar syrup. Pantuas range in colour from pale brown to nearly black depending on how long they are fried. Rose water, cardamom or other flavourings are sometimes added to the sweet. Smash the chenna a flat surface till it becomes very smooth and oily. Mix the smashed chenna, baking powder, flour, cardamom powder and ghee (clarified butter) in a bowl. Add in the smashed khoya to the chenna mixture. Knead it well with your palm till there’s no lump in it. Divide the dough into 20 equal sized portions. Roll out each portion into a round smooth shape. Heat the oil, for deep frying till 130°C – 150°C. Transfer the fried balls into hot syrup. Let them soak for 30 to 40 minutes. Pantua’s are ready to be served. Transfer the pantua’s into a serving bowl and serve hot garnished with chopped nuts.